What makes Jever ("yay-ver") Pilsener unique? For 150 year's, in the Friesland region of northern Germany, the Jever Brewery has used only pure Friesian spring water and fresh Hallertau hops in a beer that has become prized around the world for its distinctive palate and crisp, dry finish. "The only **** four star pilsener in Germany"-Michael Jackson's World Guide to Beer. "Stunningly dry and hoppy with an iron-like intensity" -The Ultimate Encyclopedia of Beer by Roger Protz. Brewed in the small farm town of Jever near the Dutch border, Jever defines the classic German Friesland pilsener. Jever has a soft yeasty palate, is clean, crisp,and refreshing, and has an assertive hop finish. 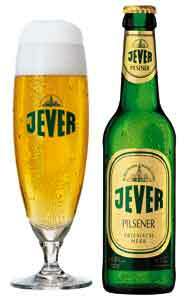 Jever has a clean and refreshing taste that compliments almost any food. Jever is outstanding as an aperitif. It will enliven your appetite. Consider pairing Jever with lighter foods such as salads, fish and pasta.